Here is the first submission for this week's TIC. Awww. . .Malieta always come through and participate in my challenge. She's such a sweetie. This is Malieta's card that she made that reflects who she is. Well, based on the card, she is one elegant lady with a touch of playfulness! "I put together a card that loosely symbolized bits of myself. My style is simple yet complex. I love company but like to be left alone. I'm soft but firm, and I love to laugh. I cry while watching a sad movie and am sensitive to others pain. I'm joyful,delightful and wishful. I'm constantly re-discovering myself and am very determined. I have a big heart but I do not give it easily. I'm just me.....just Risa (Malieta)!" I'm glad to have gotten to know such a classy lady!! Thank you Malieta for participating in this week's challenge. You're awesome!! Good Evening Everyone. I shopped at Target today and bought a Holiday stamp set by Autumn Leaves called "Winter Holidays". I decided to use it to make this card. I know the card looks a bit busy but Halloween is a fun day so I decided to make a fun card. Well, I think it looks fun. What do you think? Nothing much to the card. No special techniques, just a lot of layering with different elements. TIC #9 - Tuesday's Inspirational Challenge - "It's All About Me"
I'm sorry my TIC is a day late! I experienced a minor problem on Monday. . .my husband left for his business trip and after he left, later in the afternoon our pond/waterfall sprung a leak draining the majority of the the water out of the pond. Unfortunately, our Koi fishes died because of the low water and heat. I spent Monday afternoon and evening, as well as Tuesday morning draining the pond and removing the dead fishes. We had a total of 5 fishes and they all died. When my husband returns from his trip, we'll have someone come in and fix the problem. Because I was very annoyed, I was not in the mood to create cards! Anyway. . .now that I no longer have to deal with the pond issue, I had time to create a card for this week's TIC Day #9 - Tuesday's Inspirational Challenge. Before I begin, I need to announce the winner of last week's TIC Day#8. I had my daughter randomly choose the winner and the winner is Malieta!! Congratulations Malieta!! I already have your address so I'll be sending out your prize! Okay, this week's TIC is "It's All About Me". What is this challenge? Well. . .the challenge is to create a card that reflects who you are. . .not your style of cardmaking but your personality or how you see yourself. I created a tri-fold card but I'm not quite finished with it. I'll post the completed card sometime today. My mind is always racing with things I want to do. . .I become bored easily so I need a lot of mental stimulation. I'm always in need of constant change. . .redundancy and monotony drives me crazy. The patterns on the card is quite busy and there's a lot of movement and changing of directions. This is sooooooooo me. . . The change of pattern inside of the card reflects my almost schizophrenic need to do something different all the time. I added a few word sentiments that describes how I see myself. It's not how others see me but how I view myself. The tri-fold reflects my need for new adventures. . . each fold have a different design but elements of consistency are still present. Create a card that reflects how you see yourself and not how others see you. Here are a few examples. . .if you see yourself as quiet and simple, a white card with very simple lines and very little embellishments may reflect who you are. If you see yourself as elegant and graceful use a swirl design with monochromatic colors. If you're very feminine, pinks and lavenders with floral images are fitting. If you see yourself as huggable, soft, and gentle, cute animal images in pastel colors are a great combination. If you're the fun loving, loud, bold sort of person. . .bright colors with lots of embellishments and patterns are a great combination. If you feel you're of old fashioned, create a vintage style card. The card should reflect how you see yourself and not about making a card in your favorite style. For example, I love creating cards with cute animal images. . .but it no way reflects how I see myself but these type of cards are my favorite. You may use any image but be sure the stamped image reflects your personality. 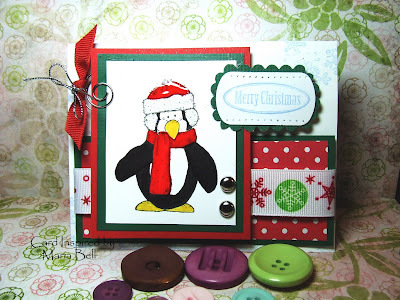 Creation of the card don't have to be rubber stamped, you may paper piece, use scrapbook embellishments, draw. . .whatever you want to do. . . Along with your card, submit a short description of the idiosyncrasy or parts of your personality. If you want to, you can also include the symbolism of the various parts of your card and how they are reflective of your personality. Feel free to create the card any way you want to. . .how you apply the elements of your personality on to your card is very subjective. . . Send a picture of your card and a short description about the card and yourself via email at lbmcd66@hotmail.com or comment this post with the URL address of your blog site or gallery. If you have a blog site, please include it in your email. Please send your submission by Sunday. All submissions will posted on Card Inspired only. 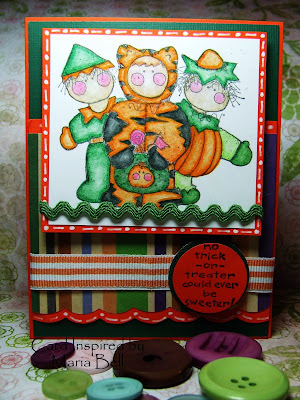 None will be posted on Stampin Inspirations even if you use a Stampin Up image. I will be drawing the winner on Monday. I look forward to seeing your card!! If interested in participating in this week's challenge, click here for the details. Tomorrow is the last day for submissions. Random drawing of the winner will be chosen on Monday! Hey check out Jen from "Pieces of Me" CD shaker card and matching tag. 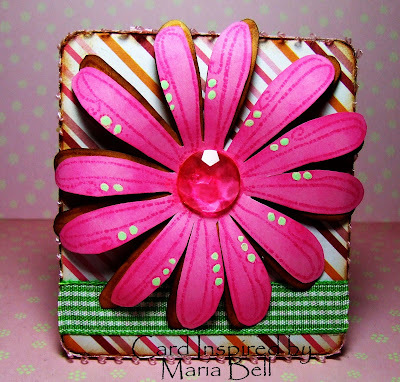 I'm glad she decided to try out my CD shaker card tutorial. . .she did an awesome job. Isn't the mouse a cutie? I love this stamp from Whipper Snapper! Well as always, Jen did a fabulous job on my challenge. She always come through with wonderful creations! Thanks Jen for participating in this week's challenge. It's always fabulous to see what you come up with!! 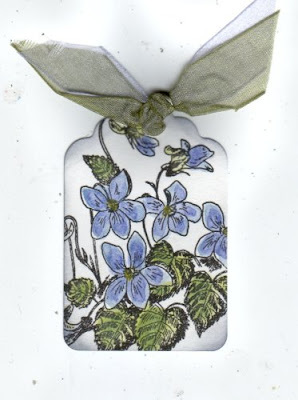 Here is Jen's fabulous matching tag! Love the scallop circle! Good Morning Friends! Check out Wendy's awesome submission for this week's TIC. Fabulous! I believe this is Wendy's first attempt with my challenges. I'm glad she decided to participate. 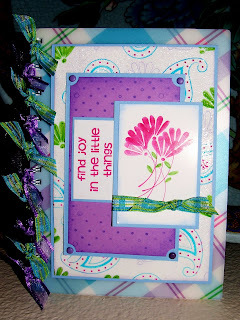 She made this card and tag for her MIL. . .how sweet of her to give such lovely creations to her MIL. 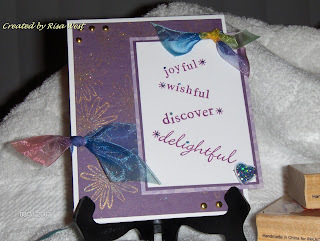 Wendy has an awesome blog site called "Crafty Butterfly Stamping Blog". Be sure to stop by and check out all her awesome creations. Thank you Wendy for participating in my challenge! Your creations are a wonderful addition to many beautiful submissions I received so far! Here is Wendy's fabulous tag! Beautiful!! This is a card and tag I created for this week's challenge. I decided to do a Thanksgiving card because Thanksgiving is also around the corner and I need to get started on that too. Sheesh, I feel pressured! Anyway, I colored the image using Prismacolor pencils with Gamsol. Nothing much else to the card but using different designer pattern paper and piercing dots to the edge. Here is the matching tag! Hi Everyone! Here's a submission I received for this week's TIC Day #8 - Tag-A-Long Challenge. If interested in participating in this week's challenge, click here for the details. 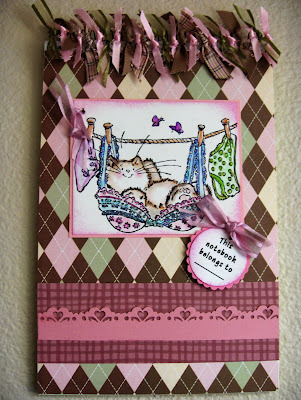 Check out the lovely card and tag submitted by Hulda of "Aunt Scrappy". Wow, I love them! 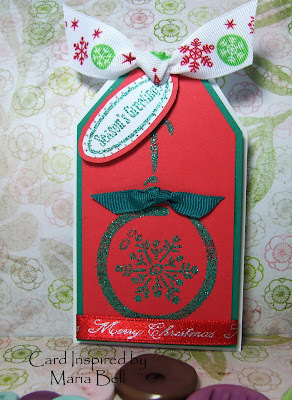 I love the designer and embossed paper that she used. I also love the non-traditional colors she used. It's beginning to feel like Christmas is right around the corner. 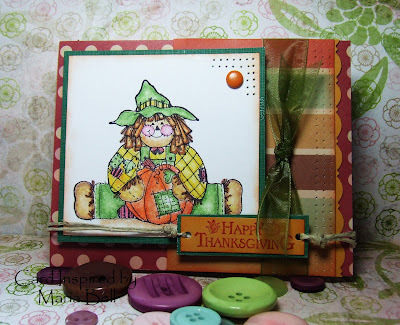 Be sure to drop by Hulda's blog site and check out all the lovely creations she has on her blog site. Thank you Hulda for participating in this week's challenge. I always love your submissions! 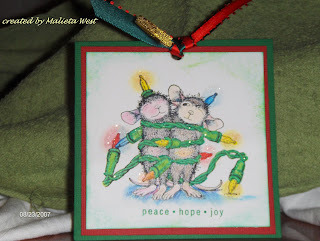 This fabulous card and tag is from Malieta! Awesome! I love her creations. She did a wonderful job on the coloring of the House Mouse image. She recently began using Prismacolor Pencils with Gamsol and she did a superb job. I love how she tied the ribbon. Isn't it great! 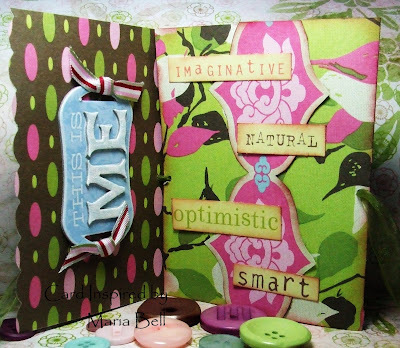 Be sure to drop by Malieta's blog site "LIfe's Simple Pleasure" and check all her wonderful cards, projects, and scrapbook layouts. Here is Malieta's fabulous tag! Thank you Malieta for once again participating in my challenge. I really appreciate seeing your work! 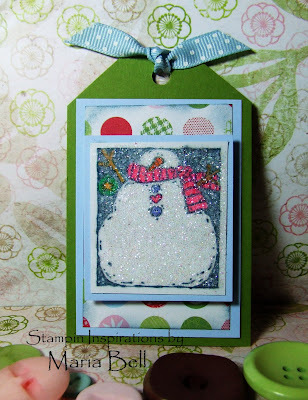 Drop by my Stampin Inspirations blog site to see the other submissions for this week's challenge! 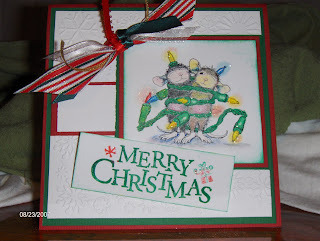 Here's a Christmas card and tag that I created for this week's TIC Day #8. I colored the image using Prismacolor Markers, added clear Stickles to the ear muffs and snow cap and I applied Crystal Effects to the Scarf and snow cap to give it a 3D effect. Here's the matching tag for the card. Hi Everyone! 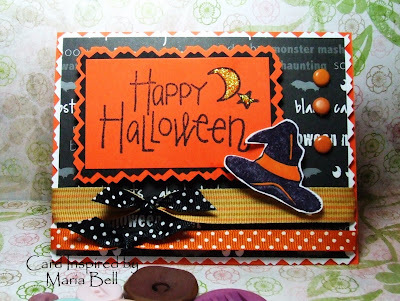 Well here's a Halloween card and tag sample I made for this week's challenge. I had planned to make more cards and tags but midday, I started to feel like I was coming down with a cold or something. I hope I feel better tomorrow. Anyway, I thought I would make a Halloween card and tag instead of Christmas ones. Halloween is right around the corner so I need to hurry and make a bunch. I colored the image using Prismacolor pencils with gamsol and traced the outline with Prismacolor markers. 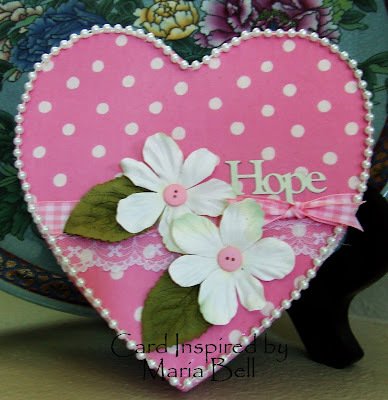 I used the Sakura Souffle gel pen to create the dot/stitch design on the mattings. Nothing much else to the card but layering the layout. I hope y'all will participate in this week's challenge. I would love to see your work! Here's the matching tag. I made this tag in a horizontal orientation. If interested in this week's challenge, click here for the details. To All My Girlfriends Out There - Enjoy! Just wanted to share this song with all of you. . .it's a great song to relax to. Hope y'all are enjoying this beautiful day! Don't forget to participate in this week's TIC #8 - Tuesday's Inspirational Challenge!! Scroll down for the details!! TIC Day #8 - Tuesday's Inspirational Challenge - "Tag-A-Long"
Hi Everyone!! Okay. . .I came up with an EASY challenge! I think my past challenges were a bit too challenging at times and I decided to make this week's one a useful one as well as easy. Because I've been making Christmas cards with a matching tag for the past few days, it prompted me to turn it into a challenge. Why? Well, my challenges for y'all is also a personal challenge. 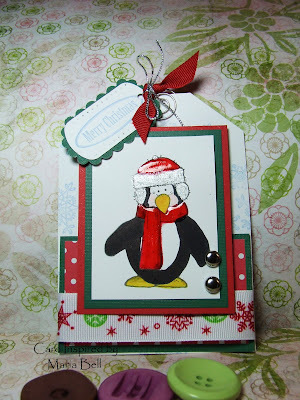 I need to make more of these cards with matching tags, especially in preparation for Christmas and the holidays. Many times when we give a card to someone, it's usually accompanied with a gift and if there's a gift, you need a tag. . .right? Well, this is a great opportunity to create a card with a matching tag. To be honest, I come up with challenges that I want to participate in. I know. . .I can be pretty self-centered. . .:) so with that said, this week's TIC Day #8 is titled "Tag-a-long"
1. Make a card of any design or theme. It don't have to be a Christmas card. It can be a birthday card, baby card, whatever. . .
2. Create a tag that matches the card. 3. The tag has to have the same elements as the card. No new elements can be added to the tag that the card don't have. You don't have to use all the elements of the card but you just can't add any additional elements to the tag. Got it? 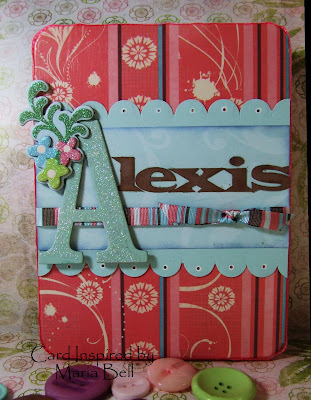 For example, you must use the same colors, papers, materials, ribbons, whatever that the card has. You can't add additional embellishments, color combo, techniques, etc. to the tag. The point is the tag has to match the card. 5. The only added element that can be used on the tag that the card does not have are the words (TO: and From:). 6. Card and tag can be of any size or shape. 7. Card and tag don't need to be rubber stamped. 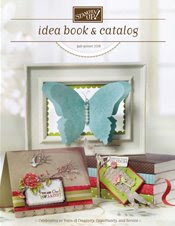 You may paper craft, draw, add embellishments, paper piece whatever you want to do is acceptable. You may send your submission as one picture with the card and tag together as shown to the left or send 2 pictures - the card and the tag. as shown in my other samples. Please email your submission to me at lbmcd66@hotmail.com or comment on this post with your blog address. Please include your blog address or gallery so I can add the link to your website. Last day of submission is on Sunday. Cards made with Stampin Up images will be posted on my Stampin Inspirations blog site and all others will be posted on Card Inspired. The challenge will be posted on both of my blog sites. I will be giving out a small prize and a winner will be randomly chosen on Monday. Okay, everyone. . .this challenge is easy so I am expecting you to participate! Most of all, HAVE FUN!! Good Morning Everyone! 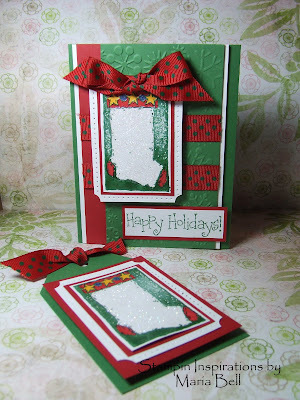 I can't believe it. . .I actually made a card before 10 p.m. Today's Daily Special is "Christmas in August". 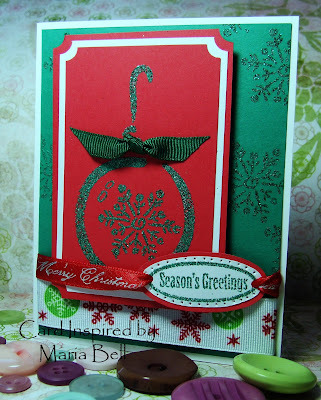 Check out my Stampin Inspirations blog site. . .I also posted Christmas cards on that site. I'm working on Christmas cards just to get a head start. I'm still debating on what TIC - Tuesday's Inspirational Challenge - I'm going to do for this week. I'll post it sometime this afternoon or this evening. 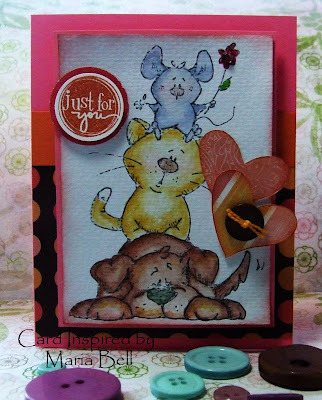 I'm heading out to lunch with a stampin' friend today and I wanted to post a card before I left. We're going to eat at a Thai restaurant. Yummy! Anyway, I remained focus, sat down and remained put and finished up the card. Many times I'll start on a card and end up doing other things and don't finish it until late at night. Nothing much to this card. . .I stamped the image with Versamark on to red cardstock, applied glittery embossing powder, then heat embossed it. I did the same with the sentiment. The rest of the card is basically layering the different elements. Anyway, hope y'all have a wonderful day. I had my daughter pick the winner by drawing a name from a box and the winner is Lindsay. I'll email Lindsay to let her know she won a small prize for playing along with this week's TIC. Thank you everyone who participated. Y'all did a splendid job! I know this week's challenge was a major challenge and I'm glad that a few of you participated. It was great that a few first timers participated. I hope you enjoyed making your altered art. Until the next challenge. . .
Hi Everyone! Check out the different submissions for this weeks TIC #7 - Altered Art - Anything But A Card Challenge! Honestly, I was beginning to think no one else but Monika was going to attempt it but these fellow crafters came through and decided to try it out!! Hey here's one more submission. I'll be announcing the winner some time this afternoon. 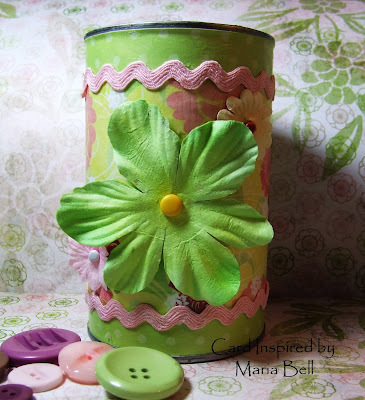 This lovely altered cocoa container is by Jen at "Angels of Hawaii". She decided to do a Christmas theme. . .good idea considering Christmas is right around the corner. Her cocoa container is a fabulous gift for Christmas! I love the different papers that Jen used to create her awesome can. . .as always, Jen made something really cool. 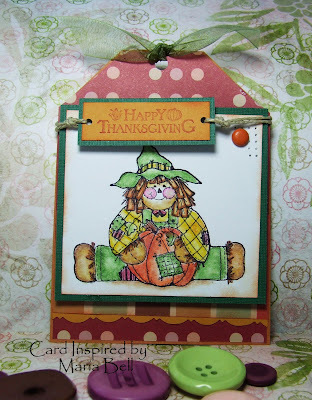 Check out her TAC blog site for other great card creations and projects. Thanks Jen for participating in my challenge! Check out Malieta's work of art! She decided to challenge herself further and create two projects and believe it or not, these were her first time to alter something! Wow, awesome! I can't believe it. I wasn't this good my first time. Nope, not at all! The picture to the left is a band-aid tin that Malieta decided to alter. Isn't it great. 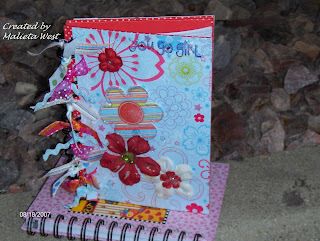 Be sure to scroll down to the next picture for her second altered project. For details on these projects, be sure to stop by her fabulous blog site "Life's Simple Pleasures" and give her a "holla"!! Well, here is Malieta's fabulous altered notebook. Don't you just love the colors and all the beautiful flowers and ribbons. Malieta said that she had a major battle with Modge-Podge! Yeah, it can be a major mess to work with the glue. Apparently, Modge-Podge won and Malieta decided to use her Xyron to adhere the designer paper. Well, she did a fabulous job. Believe it or not, this is her first attempt in altering a notebook. Wow, impressive! I can't tell that it's her first time. Thank you Malieta for participating in my challenge. You did a splendid job! Hey check out Lindsay's altered photo frame. She said that is her first attempt to alter one and I can't tell that it's her first time. Can you? Nope, it looks like a pro did it! I'm so impressed by what everyone comes up with and believe me, I learn from every one of them. Lindsay, your altered photo frame rocks! Here is Lindsay's altered photo frame. I love the paper that she chose to decorate the frame. She did an awesome job. Thank you Lindsay for stepping up to the challenge! I really appreciate it. Okay folks, check out Kathi's work of art! She decided to join in on the challenge and I'm seriously impressed by what she did with this plain ol' container. Imagine. . .typically, we would throw away the container. . .well, check out what Kathi did with it. Isn't it great! 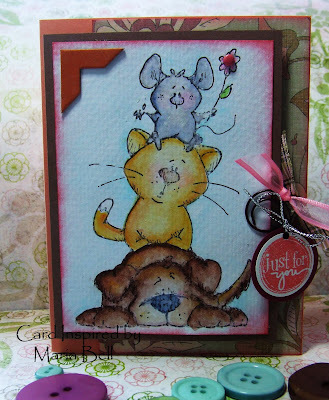 Kathi has a blog site called "Stamp Maniac". 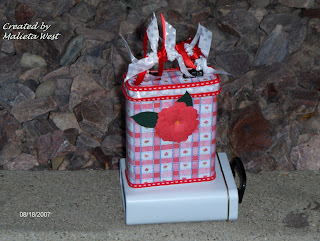 Be sure to stop by her blog site and check out the details of her altered container. Here is the container altered into a work of art. Thank you Kathi for participating in my challenge and showing us what you can do with the container. Like the other participants, her work is top-notched and fabulous! 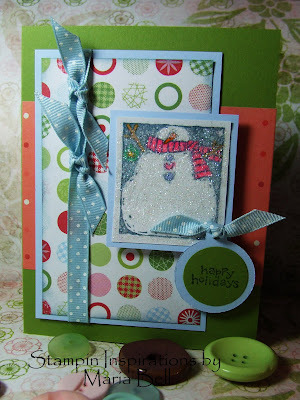 Wow check out Monika's Altered Art Gift Set!! Fabulous! Monika of "M.A.D Stamper" always and I mean always come up with such creative projects. Her work is so inspirational and I'm so glad she participates in my weekly challenges. I love seeing what she comes up with! Stop by her blog site and check out all her wonderful creations. You will surely be impressed! Here is a sample "Altered Art" I created for this week's challenge. I'm always in need of containers to store my brushes and pens and altering soup cans are so economical. 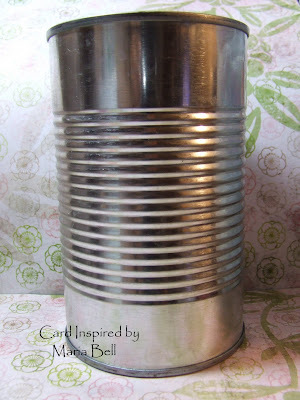 The cans are sturdy and great for storing things, Why throw them away and why buy containers when you can alter a can? Don't throw away your soup cans. . .they can be very useful. Okay, gang. . .I would love to see your altered art. If interested in participating in this week's TIC #7, Click Here for the details. Just a simple alteration of the can. I had a creative block but managed to finish this altered can. I wish I could have come up with something more creative but I'm so exhausted after working on the garage and yard today. 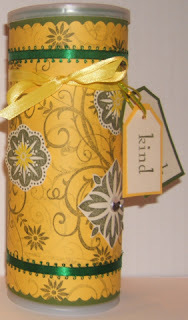 I modge-podged the designer paper on to the can and added a doodle bug type of ribbon by Making Memories and added Prima Flowers. I always resort to Prima Flowers when I can't think of a creative design. It always works . . .you can't go wrong with Prima Flowers. I have another altered project in progress. Hopefully, I'll have some time tomorrow to finish it up. I'll wake up early tomorrow so I can plant the rest of plants that we're transplanting from the front yard to the back. There's about 15 plants that needs to be transplanted. I can't wait to finish it up. I'm still cleaning my garage but I'll work on something today. . .I'll post a card this evening. Anyhoo, check out the video. . .whenever I hear this song, it makes me happy but at the same time a little sad. It reminds me of my childhood. . .not that it was unhappy but because it was a happy time. I loved this song as a child and still do today. I dedicate this song to all of you. Hope you all have a wonderful day!! Hi Everyone! Here's another sample of something I altered for this week's challenge. If you scroll down a few days ago, I had purchased these tins at Big Lot for a $1 each. . .which by the way is a steal. 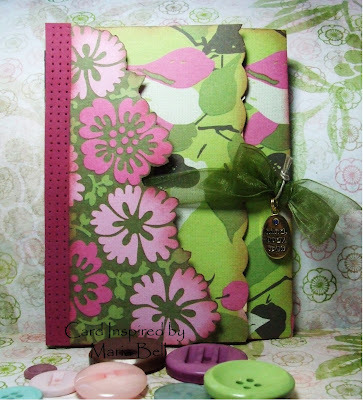 My plans were to create mini scrapbook albums for these tins. 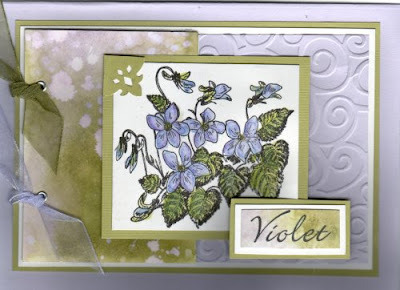 This was a great opportunity to alter this tin to show as a sample of an altered project. The tin came as shown in the picture to the left but although it's decorated, I don't like how it looks in it's original design. This is what I did with the tin. It's not quite complete. My plan is to create an accordion album for my daughter and it'll be stored inside the tin. I did line the inside with designer paper and I painted the outside bottom of the tin using acrylic paint similar to the color of the designer paper. I had to paint it because the original color of the tin is yellow and it did not match the designer paper. When I'm done with the accordion album, I'll post the completed project. In the meantime for the purpose of this week's challenge, I wanted to post what I did with the tin itself. I Modge-Podged the front using a designer paper by Autumn Leaves. I then applied Modge-Podge over the designer paper and let it dry. Once dry, I decorated the front using another designer paper by Autumn Leaves, created the scalloped design using SU "Slit" punch and added dots using Sakura Souffle Gel Pen then punched holes. The "A" chipboard is by K&Co, the glittery floral chipboard is again by K& Co. The ribbon is by American Craft Elements and my daughter's name was cut by my Craft-Robo. 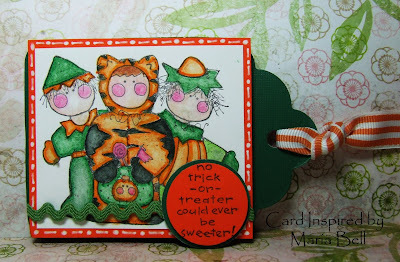 If interested in this week's TIC Day #7 - Altered Art - Anything But A Card, Click Here for the Details!! These candles were on sale at Michaels for 75 cents! Yes, 75 cents. I bought 4 of them. I thought it was a great buy especially for this week's challenge. 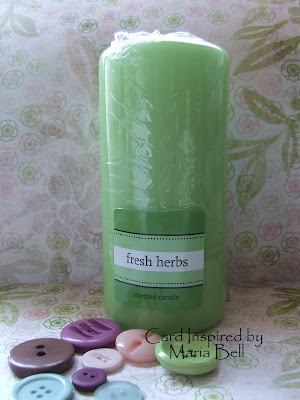 I think candles are great gift ideas and they are so easy to personalize. Who doesn't love candles especially the ones that give off a nice scent? Here is the candle that I altered by adding a cover. The candle was actually warped at the bottom because I left it in my car and it melted a little. I had to carve the bottom so it would stand straight. Do not leave candles in your car especially if the temperature outside is 100 degrees. Haha! Too funny. I forgot I had left it in the car. I wrapped scrapbook paper around the candle and modge podged the paper. 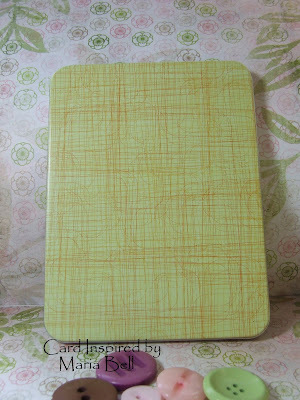 I cut out flowers off of the remaining scrapbook paper and pasted it on to a mat that was glued on to the cover. I cut a few flowers and layered them to give it a 3D effect and topped it off with a rhinestone. The sentiments are from Provo craft clear sentiment stickers. To finish up the candle cover, I added a grosgrain bow. I'm Sorry I Haven't Been Around. . . I haven't been around for the past few days because I've been busy cleaning out my garage, transplanting plants from our front yard to our backyard and cleaning out my craft room. On my down-time, I've been working on a few altered art projects. I have to work on them in stages because I have to wait for the glue to dry. I'll post something tomorrow. Hopefully, I'll be able to finish one of the projects tonight. I usually stamp and craft late at night but because I've been so busy during the day, at night I'm too tired to do anything else but relax. I wish I could just snap my finger and the garage will be clean and the plants planted. Unfortunately, it's not going to happen that way. Anyway, I've had one submittal for the altered art so far which I'll post tomorrow. Anyone interested in trying it out? I know it's a tough one but I think if you try it out, you'll find that it's something worthwhile doing. It gets easier as you do more of them. I recently bought a "Bind-it-all". . .I can't wait to try it out. I've been wanting to create my own notebooks, journals, and albums but never took the step to buy a binding machine. I finally decided that it'll be a great investment to have one of those machines so I can create unique notebooks and albums rather than buying them and altering them. There's so many things I want to create . . .it's a matter of actually making them. Well, hope everyone is having a great evening! Click here if you're interested in this week's challenge!! Hi Everyone! Yay! It's TIC Day #7!! You were probably wondering what happened to my challenges.. ..or maybe not. This one will be a bit of a challenge for those who primarily make cards. Honestly, it's a challenge for me too. I have to sometimes force myself to make something other than a card. This challenge will definitely force you out of your cozy box. Are you up to the challenge? I hope so. Hopefully, some of you will be willing to try it out! This week's challenge is "Altered Art - Anything But A Card". 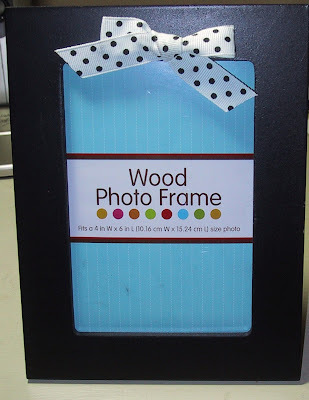 Yeah, the challenge is to alter something. . .a box, a notebook, a journal, a soup can, a tin container, a pen, a photo frame, a clipboard. . .anything that you can alter and create a work of art. 1. Alter an item such as described above. 2. Don't create the item. . .such a box or a handmade notebook using chipboards. . .the point is to "alter" something not "create" something. Submit your pictures via email to lbmcd66@hotmail.com or comment with a link to your blog site. Items created using Stampin' Up images or primarily SU products will posted on my "Stampin Inspirations" blog site and anything else will be posted on "Card Inspired" blog site. Please send all submissions by Sunday!! I will draw a random winner for a prize on Monday of next week. I don't know what the prize is but I'll post it later with an update when I figure out what I'm going to give away. And remember. . .HAVE FUN CREATING!! This is a heart box I altered. The original state was a cardboard type of box. I modge-podged the box with designer paper and added embellishments. I gave this box to my daughter. This is a Post-it Note holder I created. The original state was a cigarette tin container that I bought on Ebay. It took a bit of work to alter this puppy because the container had printed information on it so I had to paint the tin to cover up the prints. 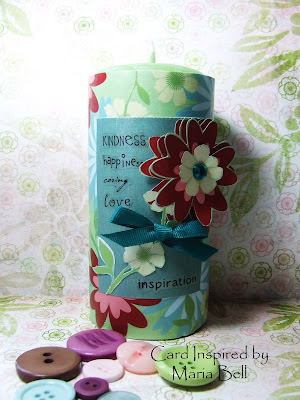 I Modge-Podge the top of the container as well as inside the container using designer paper. I lined the edge with ribbon and added a stamped flower to the front. Inside the container is a square Post-It Note. I gave this to one of my Stampin friends. These containers were made out of a diced tomato and mushroom can. I save a bunch of the cans after I cook, wash it out and keep them for future us. I still have these containers. I use them to store my brushes and q-tips. This was quite simple to make. 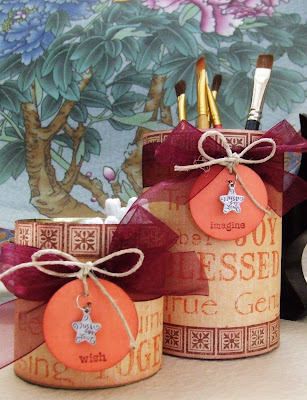 All I did was cover the cans with scrapbook paper and added ribbons and embellishments. This is a stenopad that I altered. I bought a bulk of stenobooks from Costco. . .they're really cheap when you purchase them at Costco. Big Lot and Walmart also sell bulk amounts of stenobooks. 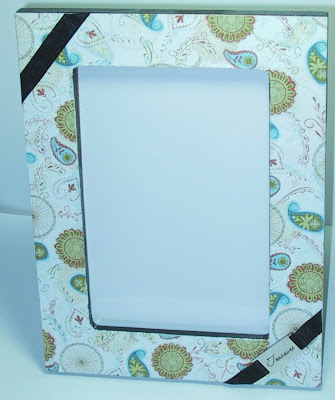 Once again, I Modge-Podged scrapbook paper on to the stenobook cover and added a stamped image by Penny Black. I embellished the spiral binding with ribbons. Nothing much else to creating this altered stenobook. I look forward to your altered art! I'm excited to see if anyone will jump in and try out this challenge. Good Morning Everyone! Wow, yesterday was a busy day for me. I'm currently cleaning OUT my craft room and bringing many of my stuff down into the garage. I decided that I'll use my garage to store my craft products, like a stock room. If I need something, I'll go down to the garage and pull it out rather than keeping everything inside my room, the hallway, and everywhere else. I think this will keep me from messing up my room all the time. A messy room drives me NUTS! Anyway, here are two cards I made for Jen's "Pieces of Me" - "All Kine Way" Challenge. The challenge is to use one main image and create two different cards with the same image. I think her challenge ends on August 17. Check it out if interested in a good challenge. With both cards, I colored the images using SU Watercolor Crayons on to watercolor paper. It's easier to watercolor than it is to with Prismacolor Pencils with Gamsol but the color is not as vibrant. The coloring time is cut more than half the time but I still prefer the results of the pencils. Random Card - Last Card of the Day!! Random Cards - Time is Just Flying By! !